Tad: We were immediately endeared to the restaurant, its pleasing decor, and easy, unaffected lighting. Service was courteous, but not prim, and our waiter took our order with tolerable efficiency. Though we came to taste the short rib, our waiter informed us that, alas! the restaurant was all out. Yet this was not entirely grounds for censure, as the staff quickly brought out several appetizers gratis, making us feel quite welcome. 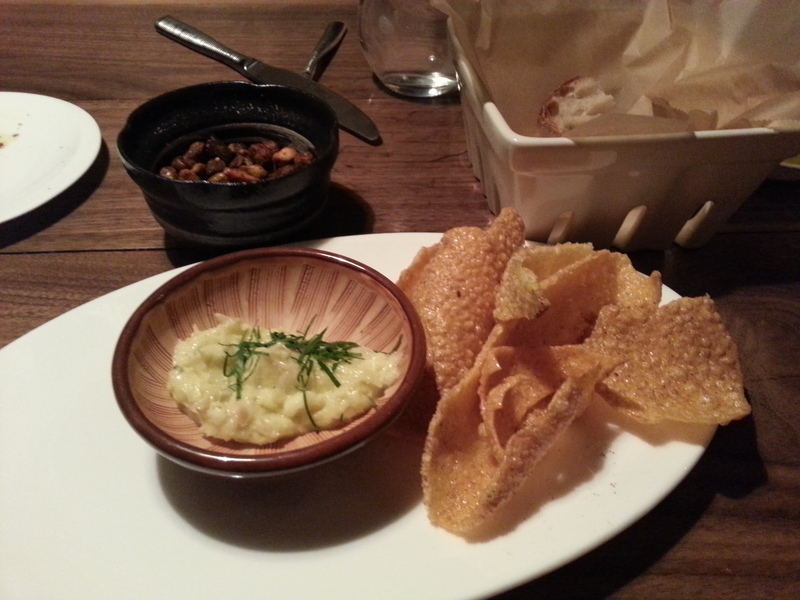 Cichetto 1: Polenta chips with “Bacalao Montecato”. Cichetto 2: Spiced pistachios with brown sugar. Tad: Pleasant, if simple, introductions to our meal. The pistachios tasted as one would expect from sugar-coated nuts. The cod also tasty, adding earthy richness to the crisp polenta chips. 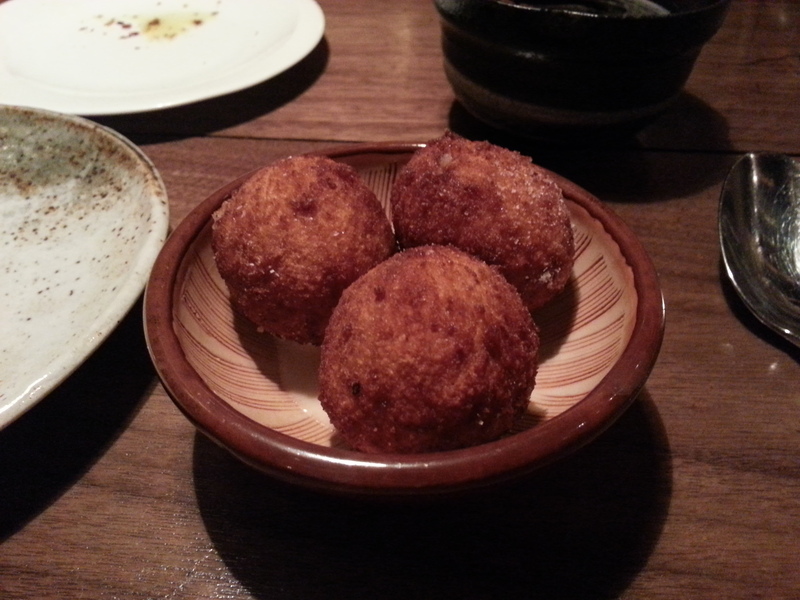 Cichetto 3: Arancini with black truffle and parmesan. Tad: I often meditate on the very great pleasure which cheese and truffle in a fried mouthful can bestow. It was no surprise that this appetizer tasted delicious; at the same time, it in no way exceeded the very similar morsel from the Dovetail bread service. 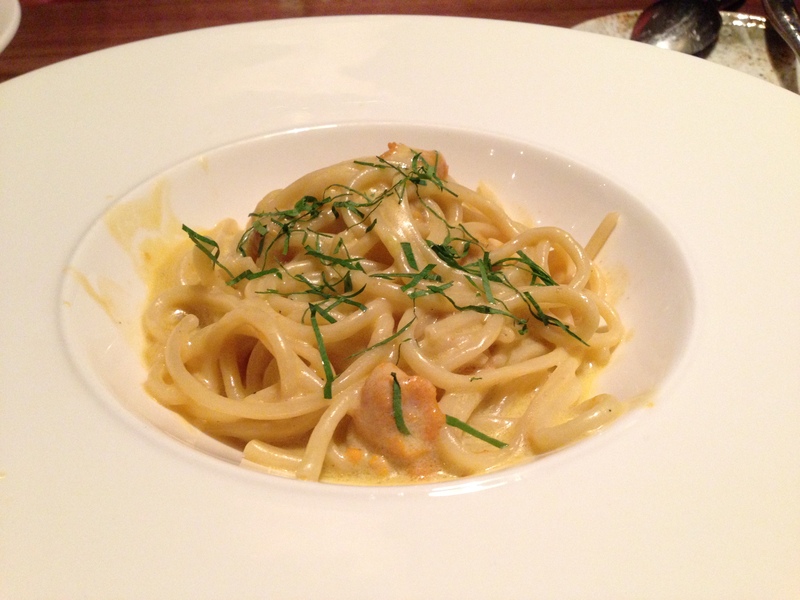 Primo 1: Bucatini with smoked uni and spicy bread crumbs. Tad: The noodles themselves were handsomely prepared, though the richness needed to be balanced with something sweet. The urchin fit just the bill, but, unfortunately, was so lacking in quantity that we only had a few mouthfuls of the chef’s intended dish. 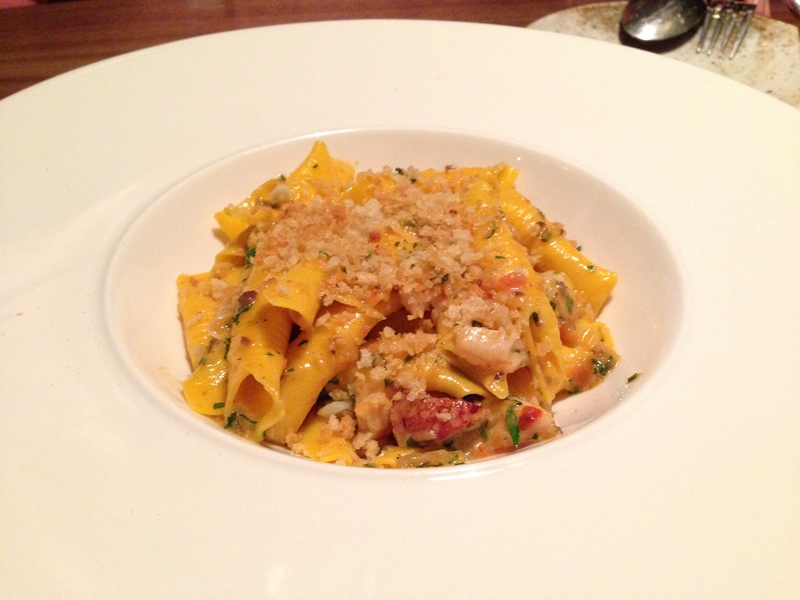 Primo 2: Garganelli with peeky toe crab, citrus, and tarragon. 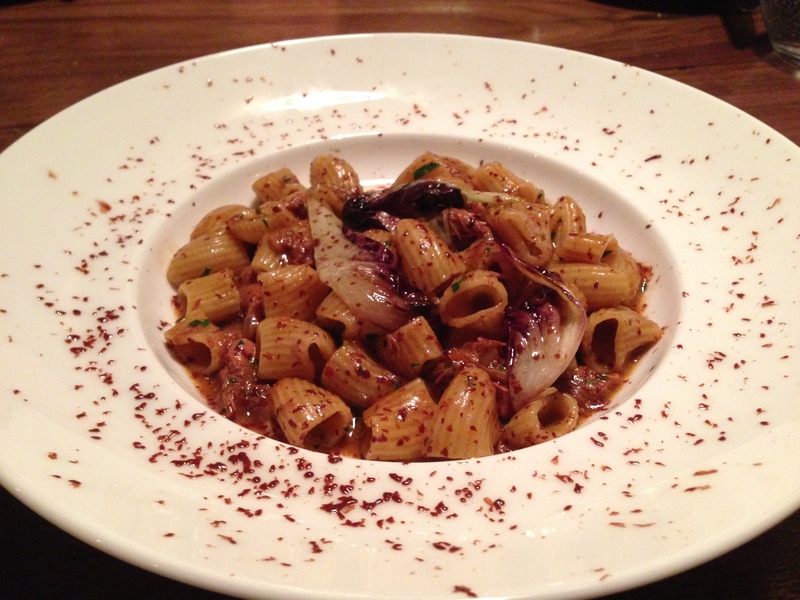 Tad: The necessary flavors and textures of pasta were all present in this dish, but the overall combination was a bit lackluster compared to other pasta virtuosos in Manhattan. The crab, however, was elegant and as fine a treat as one could wish for. Primo 3: Lumache with aged duck ragu, Treviso, and chocolate. Tad: The power of doing anything with quickness is always much prized by the possessor, and often without any attention to the imperfection of the performance. In this instance, however, the exacting precision with which the ragu was prepared could be tasted in every bite. Delightful. Overall, all pasta dishes delivered, as expected; however, we did think that an even better dish could be created by combining the texture of the bucatini, the duck ragu from the lumache, and the crab from the garganelli. 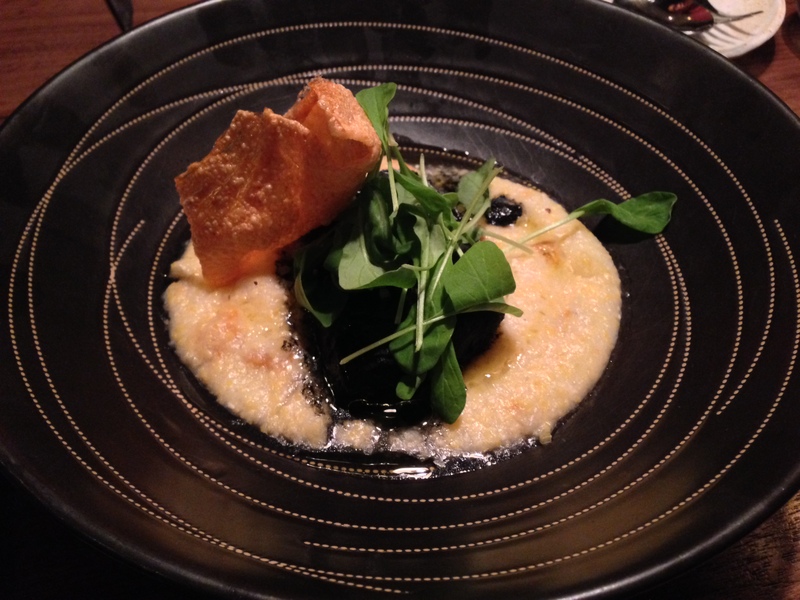 Secondo 1: Monkfish with uni polenta, squid ink, and arugula. Tad: Pleasing, but by no means capital. The polenta did its job, but I found the monkfish to be a bit plain. That it was salted to perfection did not overcome its other shortcomings–specifically, the lack of any other complexity in flavor. 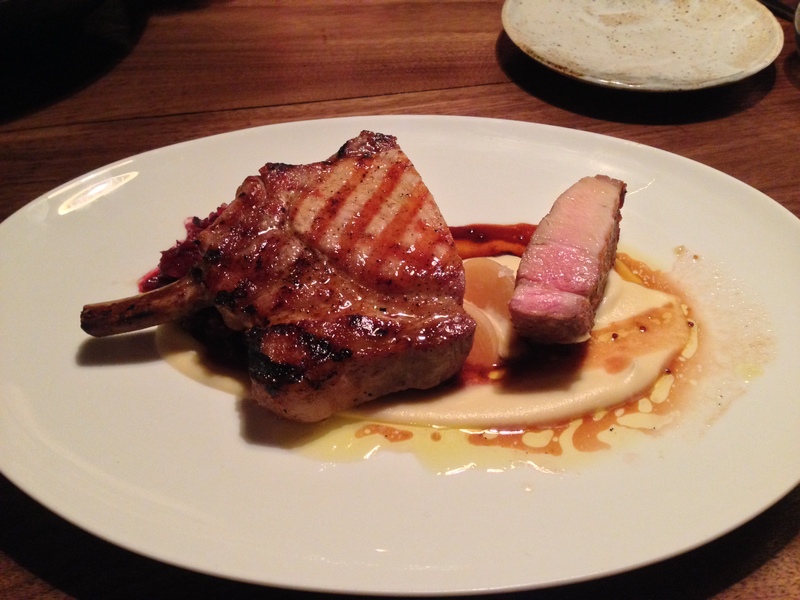 Secondo 2: Hampshire pork with smoked apples, red cabbage, and whole grain mustard. Tad: I declare after all there is no enjoyment like pork! How much sooner one tires of any protein than of pork! The flavors jumped rapidly in my mouth; from sweet to savory, from rich to creamy, to salty and a bit of spice in a moment. So what conclusion? Surely, given the highs, All’onde would be worth revisiting? Yet, though I was excessively pleased by some of the dishes, others merely diverted me for a few moments. Perhaps, at another opportunity, we will taste the short rib and be moved or altered so much that there is something new to be observed in us for ever. Until then, I can in good conscience only recommend the restaurant for casual dalliance.